Neste is committed to respecting human rights and requires the same from all partners. We take an unambiguous stand on harassment, discrimination, child labor, forced labor or any exploitation: it is neither compliant with our values nor acceptable. Neste Executive Board adopted a Neste Human Rights Commitment for the entire Group in December, 2015. In compliance with that, we are committed to observe the human rights principles of the United Nations' Declaration of Human Rights and the International Labor Organization (ILO). Respect for both human rights and labor rights play a significant role also in the United Nations' Global Compact sustainability initiative, in which we are involved. We are also committed to promote labor rights in our own supply chains. We have also included respect for human rights in many of our policies and principles. Respect for human rights is part of Neste's Sustainability Principles for Biofuels, Sustainability Policy, and Code of Conduct. In 2016, we launched a comprehensive program on human and labor rights. 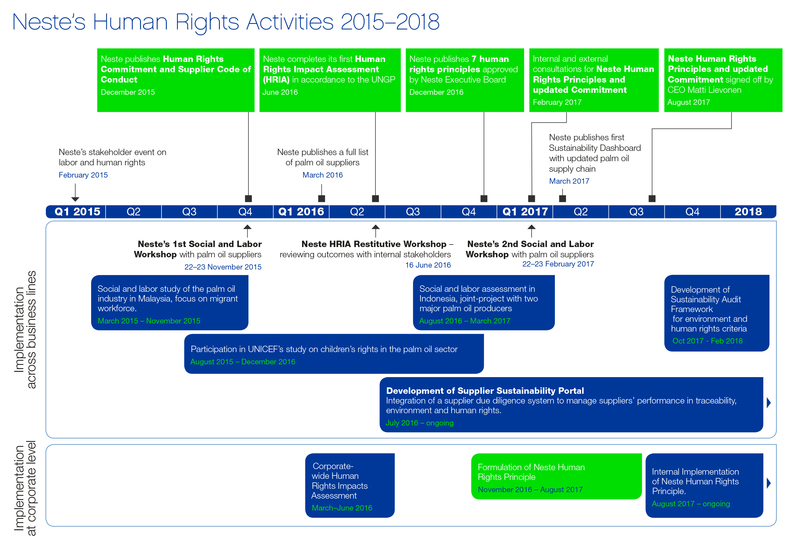 The Human and Labor Rights Roadmap crystallizes our main activities in this area. Become familiar with Neste's Human Rights Commitment.